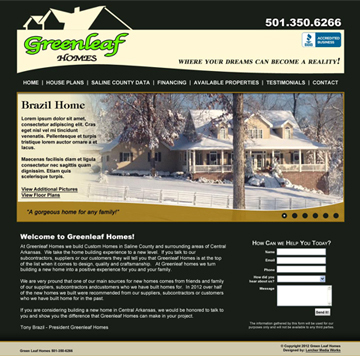 "At Greenleaf Homes the time had come to began thinking about a website for our business. After a brief search on the web we began to interview prospective companies to assist us in this process. Lercher Media Works immediately stood out from the crowd. My wife and I met in person with Greg, shared our ideas and began the process with Lercher Media Works. Greg and his company are very responsive, professional and most important to us, great listeners. At Greenleaf homes we are very pleased with our new website design, the response from our customers has been absolutely overwhelming. As a guy who grew up in the non computer age I would have never imagined what an impact this would have on the growth of our business. I would highly recommend Lercher Media Works as a great business partner for your business." -- Tony Brazil, President - Greenleaf Homes, Inc.